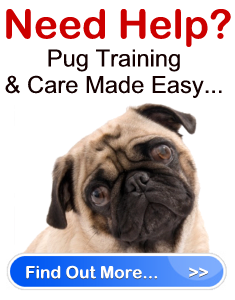 Pug Training Advice… " "
Have you ever considered a crate as part of Pug training? If not, did you know that crate training your dog can be highly beneficial to both you and your dog? When dog’s lived in the wild a den was there home. The den provided them with shelter and protection. This instinct is still engrained in your Pug. With proper crate training, your Pug will use his crate as his den and be able to totally relax in this special area which is solely his own. When you give your Pug a crate he has a place where he can feel secure. He won’t feel as if he’s being isolated, anymore than a baby does when in a playpen. Crate Pug training helps to make housebreaking an easier task. Since a dog does not naturally want to eliminate in his home, he will choose to refrain from doing so until you take him out. When your Pug is effectively crate trained he will bark and chew less, and be provided a safe place to stay when you are not home to keep him out of mischief. A crate is a safe and comfortable place for your dog when traveling. To begin this Pug training, place small pieces of treat or your dog’s favorite kibble in the crate. You can also try feeding him in the crate to crate the same effect of making the crate inviting to your pooch. 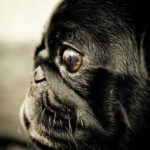 If your Pug is unsure about going into the crate right away to eat his treats or food, first place the treats just outside the door. Once he is comfortable with this, move the food inside the crate. When you are first introducing your Pug to his crate, always praise him when he enters it. Never try to push, pull or get him into the crate by force. Crate your Pug for short periods while you are at home. You will find that he will respond better to the crate when he knows you are still near him. During the first times you start the Pug training with the crate, close him up in his crate and stay where he can see you. As he becomes comfortable with this, take the next step and leave the room for short periods (5 minutes to start then gradually make it longer). When you get your Pug used to your absence while you are still at home, he will not associate being crated with your total absence from the house. How long should I crate my dog? *Note: You should never crate your Pug for more than 5 hours at a time! What should I put in my dog’s crate? Toys – two or three favorite or different toys will do (IE. Kong, ball, plush toy. Just make sure it is nothing he can choke on). 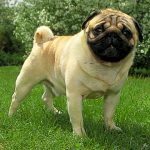 Water – If your Pug will be in his crate for two hours or more, attach a small hamster-style water dispenser to the cage. Fill it with ice water. 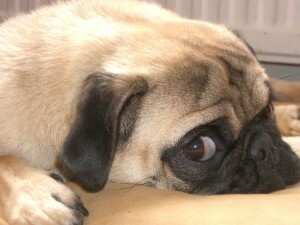 Bedding – Place a blanket or towel on the floor of the crate so your Pug has a comfy place to lie down. 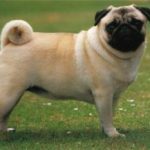 If during the Pug training your puppy eliminates on the towel remove and clean it and do not put it back in the cage until he is properly housebroken. Note: Make sure you take your Pug’s collar off before you put him in the crate. You don’t want to run the risk of the collar becoming caught in the door or the other wire parts of the cage and choking your dog. Where Should I keep the crate? Keep the crate in a well used area of your home; essentially wherever you and your family spend the most of your time. This could be the living room, family room, kitchen or hallway near the entrance. You don’t want your Pug feeling isolated while he is being crated. Do not permit your children to play in your Pug’s crate. They also should not be permitted to play with the dog while he is being crated. It is important that you let your children know how this form of Pug training works. The children must know that the crate is the Pug’s sanctuary and should always be respected. What size crate should I buy? The standard crate size for Pugs is 16in. to 22in. in length. If you want you can purchase your dog a crate that is one size larger than his recommended size. There are times when you shouldn’t crate your dog even when you are going through Pug training. Your Pug is vomiting or has diarrhea. You must leave him alone for longer than is recommended for his age or longer than 5 hours. Never use the crate as a punishment. Pug training in relation to a crate is something that will become easier with time. Be patient and persistent with your pup. The sooner he understands that the crate is his special sanctuary, the less he will reject it.